on every monday since march (right after the earthquake actually), i have been taking kimono lessons in my neighborhood in tokyo, where i learn how to wear japanese kimono on my own. embarrassingly enough, i don’t know how to put it on by myself despite my cultural background, since someone else always did it for me. taking the lesson every week, i have realised how mentally exhausting it can be to learn something brand new, especially at this stage of my life where more than a decade has long past after graduating from the university. after each lesson, i come home being literally worn out, overwhelmed with the mixture of familiar/unfamiliar words and rules concerning the japanese tradition and history. still, acquiring this particular skill is a delight and a great addition to my life, as if this will fill in another missing puzzle of my being. every monday at 2pm, my teacher, a short, charming and cheerful lady presumably in her 60’s, greets me at the entrance door of her home, always in different and unique types of seasonal kimono. each time i open the door with an anticipation of the colour, material, pattern and small trinkets of the kimono she beautifully wears. during the 2-hour lesson, while i learn the practical side of kimono dressing, my mind often trips back to my childhood memory. a vision of kimono, a smooth & cold texture of silk, a smell of this particular aroma specific for keeping all the garments, a posture of an elegant bow on the floor… all of which remind me so much of the time i spent with my grandmother when she was still alive, who used to teach japanese tea ceremony in her kimono at home. she allowed me to be around when she was teaching, and tried to show me how to do it a few times. but all those attempts always ended up in failure, because i was not so interested and never appreciated the fact that i was so close to it. now that she is gone, i realise the significance of what i missed out. the sense of regret waves into my head, and my heart starts to beat a little faster than normal. but then my mind comes back to the present and the reality of another practice goes on. at the end of the lesson today, the teacher told me that it was her mission to encourage the young generation of japanese people to wear kimono, in order to preserve and pass on our culture to the future. being married to a non-japanese person, it is quite likely that i may move out of japan with him one day in the future. but even when this happens, i want to take them all with me to wherever we go – the subdued, yet unyielding values this country has taught me. having a dutch husband, coming up with potato dishes becomes always a challenge. he was raised on potatoes and absolutely love them. the problem is, since japanese don’t eat as much potatoes as westerners, i can only think of a few dishes to cook. once i cooked 肉じゃが (nikujaga), japanese stewed potatoes cooked with onions, carrots, pork slices, seasoned with soy sauce, sake and mirin. in the japanese kitchen, the dish is regarded as おかず (okazu), a side dish. i served it along a bowl of white rice, miso soup and some other side dishes like pickles or something, and my husband got a bit furious and said to me, “why are you serving rice with potatoes?!? i don’t need any rice, i can’t have two different staples at the same time!….” this was totally a brand new experience for me. in fact, i’d never had potato dishes without rice. here again, i stumble upon yet another cultural difference. anyway, i wanted to explain how important potatoes can be for a dutchman. 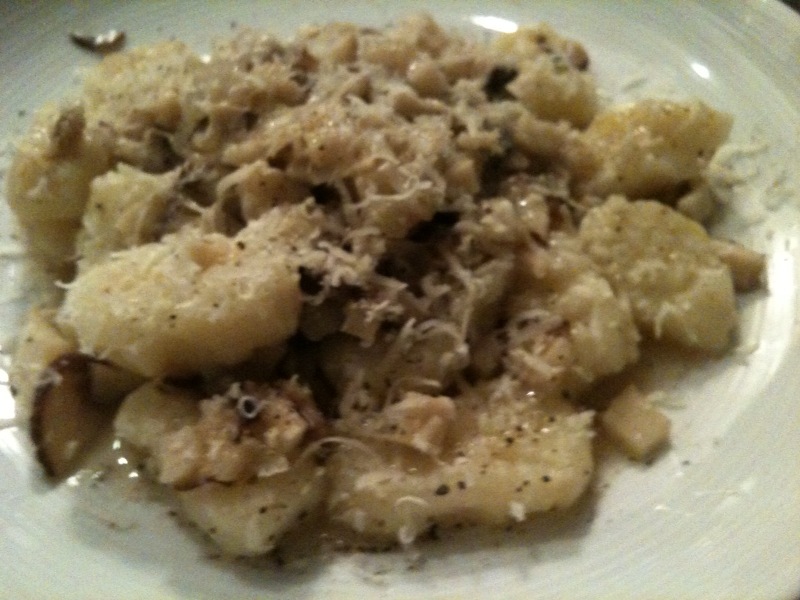 to my dismay, i always end up wasting potatoes (they tend to start sprouting on me), and this time, i didn’t want to make it happen – hence the gnocchi. it was so easy actually and came out nicely. final result? a smiling husband. 1. first you boil the potatoes (approx. for 20 – 25 min). 4. put the flour and the salt. that’s it! from 5 – 8, it’s easier to do it with extra flour. boil it in boiled water, and when the gnocchi start to float over the surface, it’s ready. drain the water and mix it with the sauce. 5. add the water and chicken stock and cook for another 3 min. or so. when serving, sprinkle over the grated parmiggiano leggiano & extra pepper. last night i was trying to look up some recipe on the internet for an italian dish and came across this amazing blog called FXcuisine.com by a swiss gentleman. the blog is about food & cooking – the theme may not be so unique these days (well, mine included), but his blog is something totally special from any other food blogs that i have ever encountered. what is so special about it? perhaps it is the diversity of his recipes, the quality of all the photos (his kitchen looks like a photo studio), his nice & beautiful kitchen utensils, the attention to details, the preciseness of his explanations, the fact that the recipes are translated into 4 different languages (my gosh), his passion and interests to different types of cuisines, the consistency of his themes, etc. etc…. browsing through his blog, i realised that he’s even been here in japan, enrolled in a cooking class for soba noodles, visited a craft centre for japanese knives, went shopping at a famous kitchen tool street called 合羽橋 (kappabashi). and he is not even a professional cook, but is working in finance/legal sector… just incredible. going through his blog, i felt as if i bumped into a long lost friend, with whom i used to share my childhood in the past. maybe it is because we share something in common, even if it is over the cyber space. it is funny to get caught by this feeling of nostalgia from someone i have never met. 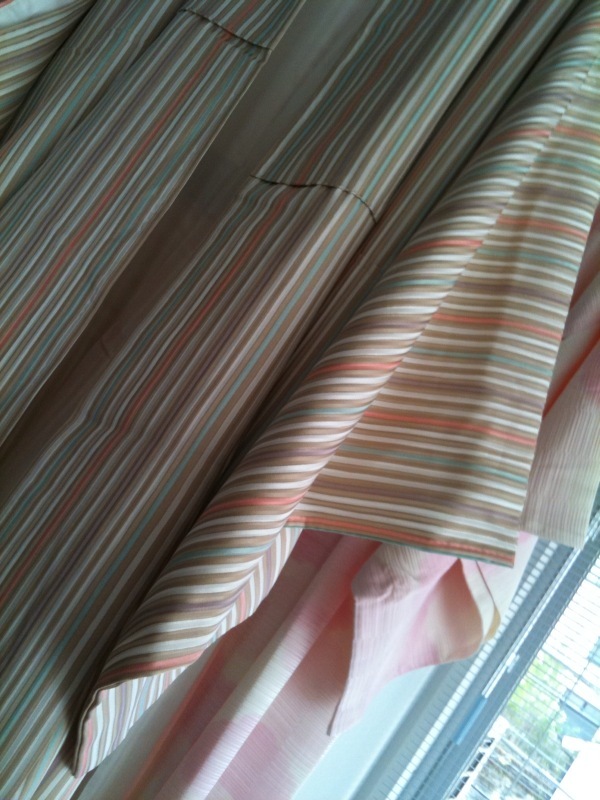 la primavera e’ qui – spring is here! for the dinner last night, i cooked a springy dish from italy called pasta piselli (green peas pasta), along with a side dish called ratatouiile (vegetable stew) from france. 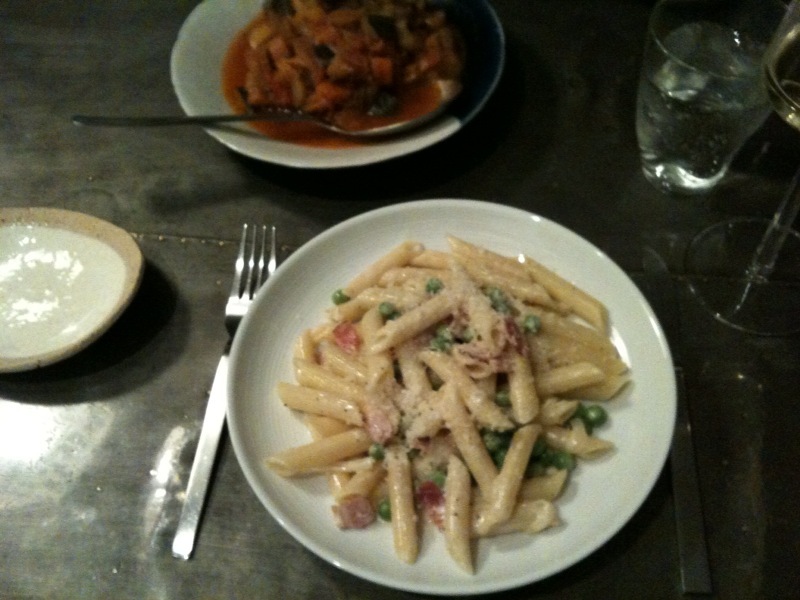 i made the pasta piselli for the first time, and was so surprised how easy it was to prepare with a great outcome. the composition of the 3 pastel colours of light green, pink & white reminds you how bright and uplifting the spring season can be. in a frying pan, pour olive oil and lightly stir-fry the sliced onion. once the onion becomes transparent, add bacon and fry more until the bacon is nice and golden. add the white wine and bring the wine to boil. add the cream and bring it to boil again. add salt (just a little) and pepper to taste. in the mean time, bring water to boil in the pasta pan and add a generous amount of salt. cook pasta for 10 minutes or so (vary depending on the type of pasta), and when the pasta is al dente, add the green peas, and cook for another 1 and a half minute. add the pasta & peas to the sauce and mix them gently in low heat. once mixed, place the pasta on serving plates, and pour a table spoon of parmiggiano leggiano for each plate. due to the ongoing problem of the nuclear reactors in fukushima, there have been some concerns on contaminated water and food products also in tokyo. 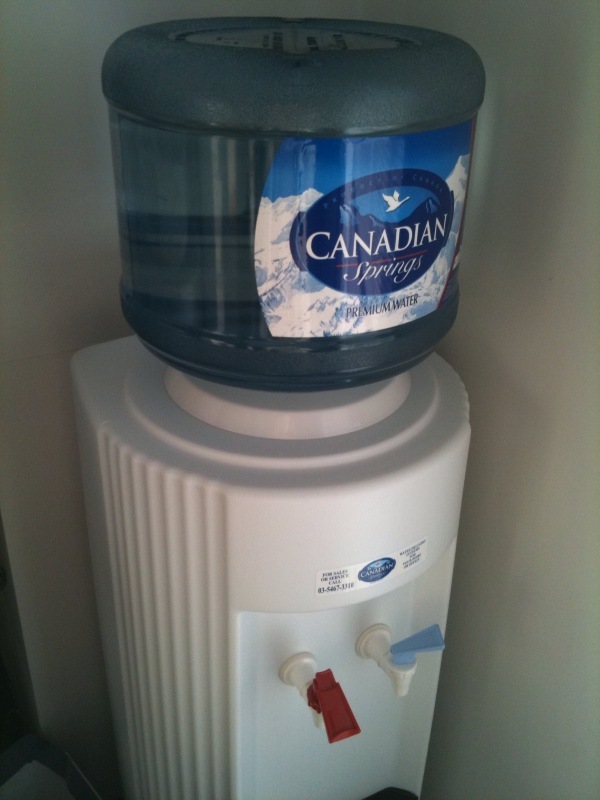 taking precautions, we have hired a water dispenser and are buying gallons of spring water from a company called canadian springs (its distribution agency happens to be located in our neighbourhood in tokyo). we are using the spring water for drinking mainly, and sometimes mixing it with the tap water for cooking. it is a little more expensive than japanese mineral water, but we wanted to avoid buying the water locally so that the locally supplied water can go to those people who are in need much more than us (small babies and children, pregnant mothers, etc.). until now, neither my husband nor myself ever thought of having the water delivered at home from a foreign country. in fact, i would have thought that it was such a ridiculous idea to buy water from overseas, have i not experienced the threat of radiation from the nuclear plant. however, the presence of the water dispenser filled with clean, safe water at home is definitely reassuring under the circumstances. i am still a bit sad though. the water in japan used to be extremely clean that we never had to face the danger of using the tap water. natural spring water in the countryside being so clean that it could be drunk directly from the stream. i believe it still is clean in most of the areas except for the proximity to the affected areas and metropolitan areas, but what if it is not? the risk is there. i wonder how long it will take for the threat to be vanished. a year? 2 years? 10 years? or it could be a lifetime. 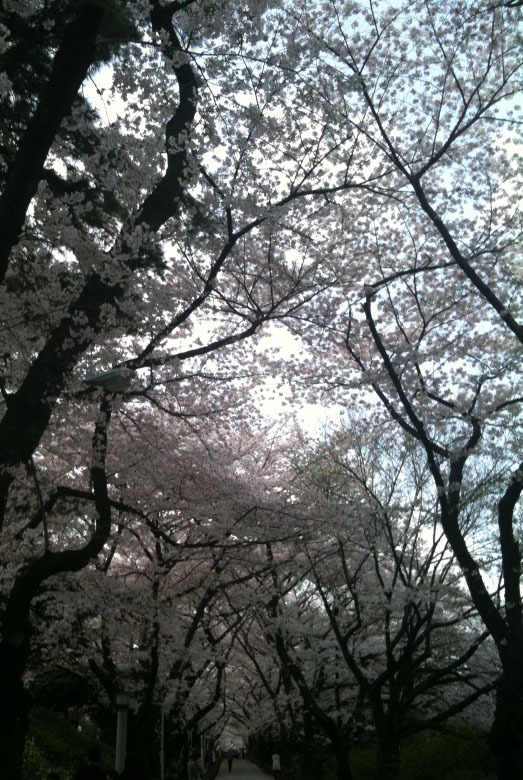 sakura, cherry blossom, bloomed to its peak over the past weekend in tokyo. the city is embraced with baby pink petals floating in the air so gently, landing onto your shoulders, onto grounds, filling up street surfaces with its sweet pink carpet. couples walk hand in hand, small children with their parents and grandparents, friends gather giggling while taking pictures with their mobile phones. walking along the path of sakura trees, it inevitably brings everyone a huge smile, and every single smile is filled with contentment. the spring is here. the life of cherry blossom flowers is about a week or so. because of the frail nature of its short life, we take in its incredible beauty as much as possible while it is alive. whether it is true or not, this year’s sakura appears to be exceptionally pretty and compassionate, as if to cheer our troubled minds and help us keep our chins up. everyone is encouraged somehow, by the sakura’s universal beauty, its friendliness, which is a great excuse for an annual outdoor spree. i am grateful, to be in japan, to see the sakura blossom in my own eyes, and to feel the sweet touch of soft, warm spring air. as i was writing this post, another big earthquake hit (at 5:17pm) – this time it was M7.1. and scale 6, at its seismic center in fukushima. our apartment in tokyo shook quite a lot too (scale 4 according to the news report), with the sound of glasses rattling on the kitchen shelf. actually, it has been exactly a month since the powerful earthquake & tsunami hit our country on the 11th of march, 2011.
the earth is still shaking, as if it is trying to tell us something, as if it is exploding with rage for something we have done in the past. i wonder if this is ever going to end.